In the mean time, how do you like my Althea Birthday cake? Althea was so awesome this month and they had sent the birthday box with a birthday kit which I used to decorated the cake box! The first item in my box is this With Shyan Nail Lacquer. This nail lacquer is one of the many different shades from it's Solid range of available colors and the one I have here is in pastel grey called Dawn Fog. They also have a Metal line of colors that's more shimmery What I like about this is that it is long lasting. I would recommend to use two coats of this along with the nail prep set also from With Shyan ensure that the color is opaque and it stays on. There are about more than 20 shades to choose from as well. The next time is actually three different types of face mask from MOKSHA. This brand carries a variety of different mask packs for different skin problems and skin types. 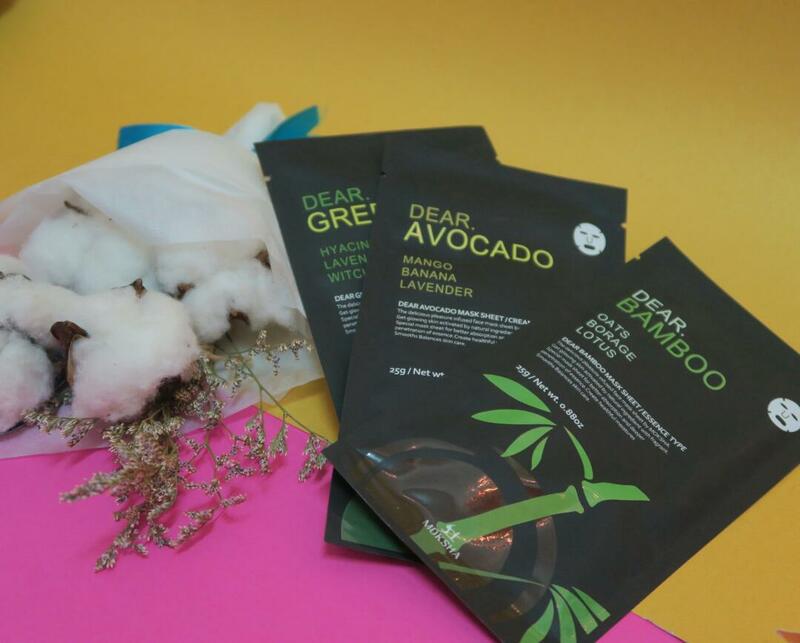 I have three of the masks here in Dear Avacado, Dear Bamboo and Dear Green Tea. The functions of all three masks are different. The Avacado mask moiturizes and nourishes the skin. The Bamboo mask helps hydration and avoid skin looking dull while the Green Tea mask replenishes your skin with the green tea extract and invigorate your skin making it look fresh and clean. 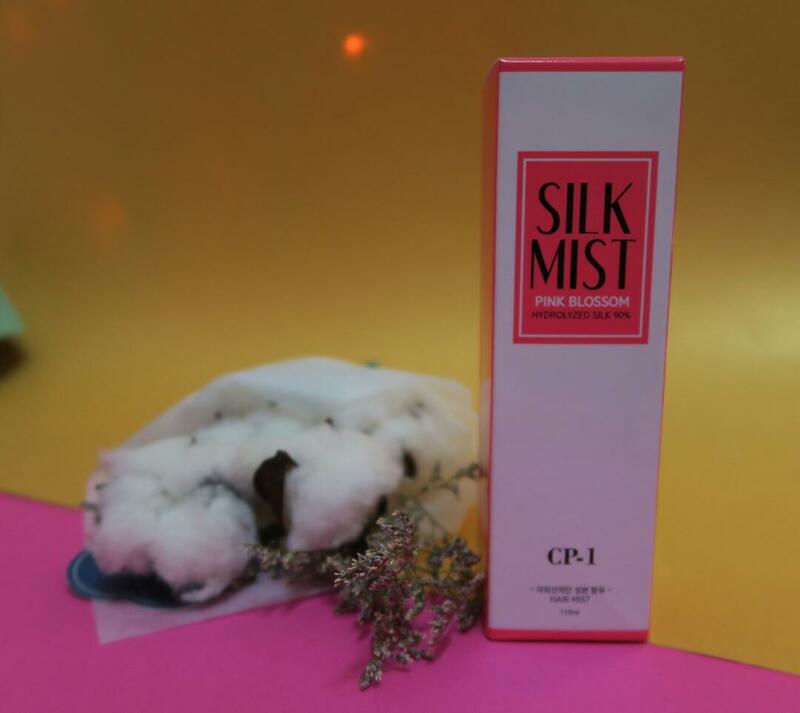 This Silk Mist that I have right here by Piolang is one product that I have fallen in love with. The Silk Mist in Pink Blossom is very lightly scented which I love. Not too over powering! The plus points of this hair mist is that it leaves the hair feeling soft and smooth all day long. It nourishes the hair with its ingredients such as keratin and argan oil. It is suitable to use when hair is dry or on damp hair. It is even good to use after you blow dry your hair. This silk mist is also available in the scent Bubble Soap. This is another product which I received in my birthday box. I've never tried any product like this one for the elbows. I do have rough elbows and sometimes it is pretty dry. This product right here, the Callus Care Elbow Patch by Petitfree is definitely one product to try. The box comes in a pack of three with a pair each. All you need to do is put on the patch after you've clean or washed your elbows. I would suggest to use this after shower so that your apply them on clean elbows. 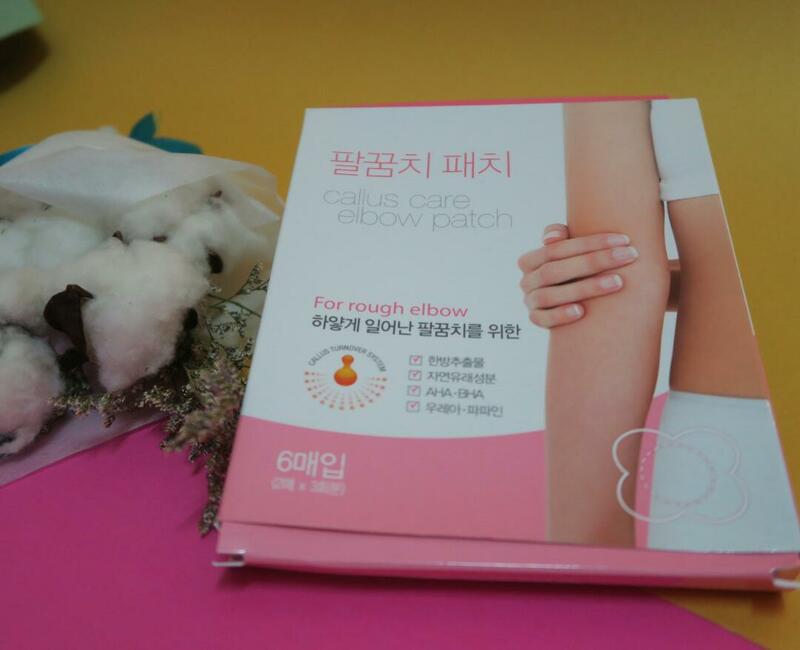 This elbow patch helps get rid of the dry skin leaving your elbows smooth and soft. I tried and the results can be seen. It has ingredients that will remove dead and dry skin while the patch is on. So,this is another product by Piolang. It is the Raspberry Treatment Vinegar. It comes in a full size bottle of 500 ml so it is definitely worth the price. 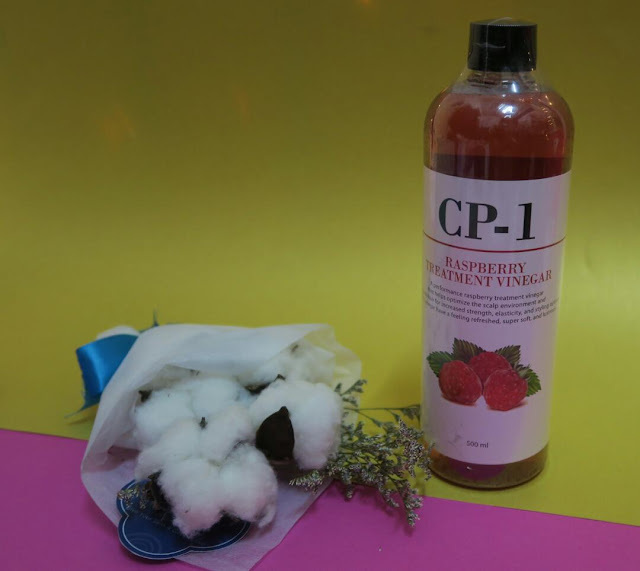 This raspberry treatment vinegar is good for cleaning the scalp and leaving it fresh. It softens the hair as well. Although it is infused with vinegar, the scent is more of a raspberry scent which is good. It leaves the head and scalp feeling fresh and smelling fresh as well! Plus it has a cooling effect after usage which is another plus point. I've read n the Althea website that says this product is also good for hair that has sweaty odor. If you face this problem then this is the right product for you. Well, this next product in my box is one product that cauht my attention. Would you believe that this product right here is a handcream?! Yes!! It's the SQUEEZING FRUITS Handcream by Guerisson. It comes in three fruity and sweet scents: Grape, Mango & Peach . Mine is in peach & I love it! It contains 30ml of product. Thumbs up for such a cute packing that reminds me of Ribena. It is easy to carry around because of its size. What I love about this is not only the packaging but it contains high Moisturizing properties from all these ingredients such as Triple Seed Butters, Olive Oil , Cacao Seed Butter, Cupuaçu Seed Butter and Murumuru Butter. It moisturises rough, dry and chapped hands leaving it smooth soft and healthy. Last time in the box is the Grapefruit Body Wash by Hello Everybody. This body wash is from their Grapefruit line. This line consists of a range of products for your hair, hands, and body. I decided to get this because I love the scent grapefruit. It has a sweet scent and I like it because when I use it, it makes me feel like I'm on a holiday! The reason behind this is that my travel size body products have the same scent. 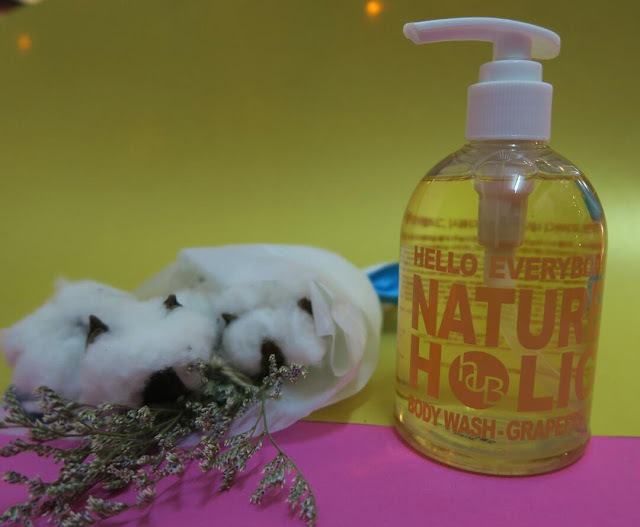 This Naturholic product is made from real grapefruits so it gives you that fresh feeling after use. Alrighty!! 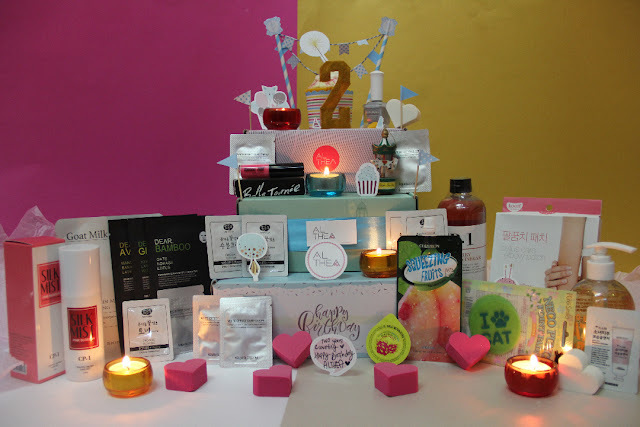 So, that's all the products in my Althea birthday Box! Althea also sent a few samples with the box along with their birthday kit. A video is on its way so keep a lookout for that. Also, please stay tuned to my video which I will be submitting in hopes to win a trip to KOREAAA!!! fingers crossed! Let me know your favourite products out of all the products I received and if you've tried any of these please leave your feedback as well! Ah, so envious of your beauty box. I can make good use for the products, myself.